What should you say to a widow or widower on Mother’s Day? In my last post*, I shared reasons the day can be difficult for many people. I told how my Mom’s death “still” impacts the way I feel about Mother’s Day, but I avoided expressing how I feel about it as a widow. To be blunt, most widows and widowers don’t look forward to Mother’s Day — we dread it. ** And yet, we still want it acknowledged. I became a wife before I became a mother, so Mother’s Day was — for me — as much about being my husband’s wife as it was about being my children’s mother. My no-longer-little girls were in their teens and twenties when their dad died. For 24 years he’d honored me as his wife every Mother’s Day, over and above the way he honored me as the mother of his children. Suddenly, half the “wife and mother” adulation was wrenched from that day’s annual pampering. Mother’s Day is confusing now — and painful. I’m still my husband’s wife, but as a widow — his widow — I have no husband. I’m still our children’s mother, but with their father deceased I’m no longer the “wife and mother” I was for more than half my life. Honoring my motherhood is interwoven with recognizing my severed wife-hood. Mother’s Day reminds me of what I had … and of what I’ve lost … and of what I still have. As I said, it’s confusing. 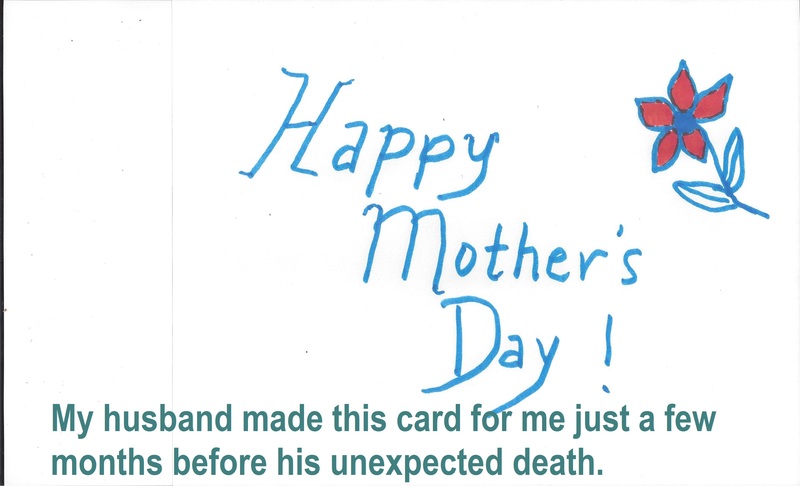 My husband made this Mother’s Day card for me just a few months before his unexpected death. For a widow with children: Let her know you realize that Mother’s Day will be difficult without her spouse. Ask her if you can take the kids shopping or create an art project or craft or make a card with them. It’s not about the gift. It’s about having someone show her children that she’s appreciated — and that her kids should also express appreciation for her — without her having to prompt it. She’s no longer “just” their mother; she’s got to handle all the responsibilities that were once shouldered by both parents. For a widower with children: Let him know you realize that Mother’s Day will be difficult without his spouse. Offer to help him in the same way you might help a widow with kids. He’s now handling all the responsibilities of both father and mother. Remember: He’s still grieving the loss of the mother of his children and he’s facing the lifelong pain of helping his children (no matter their ages) as they grieve their mom’s absence. For widows and widowers without children: Let them know you’re aware of them, and, if it’s appropriate, let them know you realize that Mother’s Day may be more difficult without their spouses. Exercise discretion. Some may have wanted children but been unable to have them. Others may have chosen to remain childless. Don’t base your interaction on assumptions. It’s better to say something than to say nothing. You won’t “make” your friends feel sadder by speaking of their lost loved ones or “remind” them of their pain. (The sadness always exists, simmering below calm exteriors even when time and “healing” have taken place.) Even hearing “I don’t know what to say” can comfort and uplift a mourning heart. **I recognize that everyone reacts differently. Some widows and widowers may still look forward to the day. More of the ones I’ve spoken with, though, view days like this the way I do. If you have other suggestions that might be helpful, please share them in the comments below. Thank you for sharing your insight. “It’s better to say something than to say nothing” – it’s so true! You’re welcome, Yumi. After my mother died I wanted people to speak to me about her, yet (for a while) I hesitated to mention her to my father. I was afraid I’d “remind” him of how much he missed her. I think that talking with people about the loved one we’ve lost gives us a chance to instead remember and reflect on that love. Yes, it can bring on tears, but that’s not a bad thing.